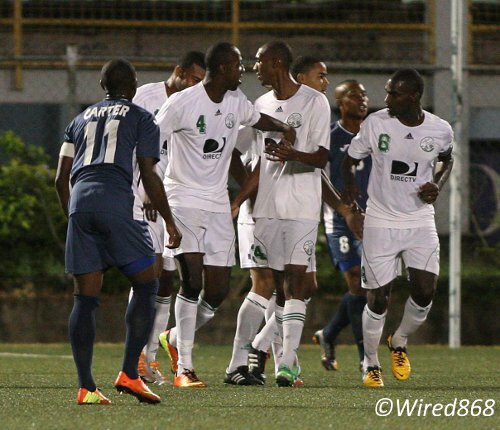 North East Stars booked its second Cup final against DIRECTV W Connection within a month at the Marvin Lee Stadium, Macoya tonight. Unsurprisingly, penalties were involved. Despite being a player short for the final eight minutes, the Sangre Grande-based team was perfect from the penalty spot as coach Angus Eve’s men edged Central FC 5-3 in the first semi-final match. The Cup specialists now advance to their third final from Trinidad and Tobago’s four domestic knock out competitions in the 2012/13 season. Photo: North East Stars fans show their appreciation for captain Cleon John after the club’s Toyota Classic triumph. 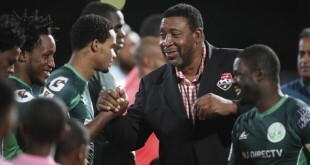 North East Stars will face W Connection from 8 pm on 29 May 2013 in the Digicel Pro Bowl final at the Hasely Crawford Stadium, Port of Spain. Connection also advanced to the final on penalties as the “Savonetta Boys” overcame Defence Force 4-3 in a shoot-out at Macoya. Both semi-final games ended 1-1 after regulation time. Andrei Pacheco tapped home a Kurt Frederick cross from close range after just eight minutes as Connection looked set to continue its storming close season form. But Defence Force grabbed a deserved equaliser in the 74th minute when striker Devorn Jorsling curled home a brilliant free kick for his 28th goal of the season. 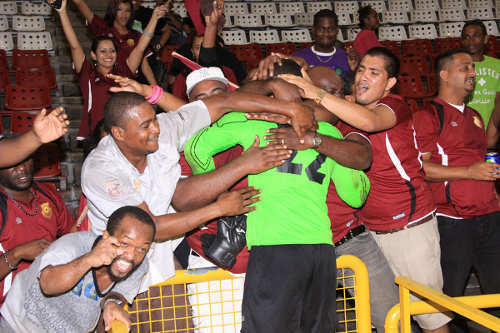 Jorsling was awarded a giant flat-screen television at the end of the match by Brooklyn-based football enthusiast and Wired868 forumite Earl “Mango” Pierre as a reward for leading all Pro League scorers. It might have gotten better for Jorsling’s teammates too as Jemel Sebro drove towards goal in the 85th minute only for teenaged defender Alvin Jones to turn his close range effort overbar with a brilliant lunging block. 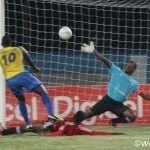 In the subsequent shoot-out, Defence Force captain Kevon Carter hit the post at the death and Connection’s Colombian goalkeeper Alejandro Figueroa denied Richard Roy as the Couva-based team dug out a slender victory. The result means a replay of the Lucozade Sport Goal Shield final, which was played just last month, when Connection defeated Stars by a similar 4-3 score on penalties after a goalless 90-minute period. 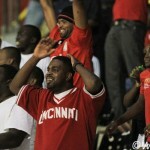 Photo: DIRECTV W Connection celebrates an early goal while Defence Force captain Kevon Carter (far left) looks on. Connection is the only team to defeat Stars from the latter team’s five shootouts this season. If that is a lottery, then Eve must be chairman of the National Lotteries Control Board (NLCB). From 23 penalties taken in shootouts, Stars scored 19. It is even more impressive when you expunge Jamaican midfielder Keithy Simpson from the records, as he is responsible for three of their four misses. Without Simpson, Stars finished 95 percent of their post-regulation time penalties. After an uneventful first half, Central should have opened the scoring in the 50thminute. Anthony Wolfe headed down a Jason Marcano cross for Darren Mitchell, on the edge of the six yard box, but the midfielder shot too close to Stars custodian and captain Cleon John, who made the save. The first sight of goal temporarily swung open a tense affair. Eight minutes later, Stars went ahead as talismanic striker Cornell Glen played through the legs of Central defender Dario Holmes and Kennedy Hinkson ran on to the pass and steadied himself before burying the ball high at the near post. Stars had barely finished celebrating when Central equalised. Tobagonian striker Rundell Winchester dashed into the gap between right back Elton John and central defender Glenton Wolfe and produced an improvised, lobbed finish that left (C) John flatfooted. There were no further goals. Central and Trinidad and Tobago goalkeeper Marvin Phillip was quick off his line in the 69th minute to deny Manners, after a clever Hinkson pass. 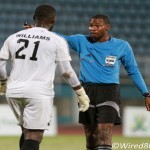 While talented Stars substitute Marcus Gomez produced the only other talking point as he lasted just 20 minutes on the field before he was shown a straight red card for a word out of turn to referee Rodphin Harris. The ejection was particularly worrying as Gomez is a teenaged schoolboy with Arima North Secondary while Harris, by profession, is a soldier. Gomez is now suspended for the Pro Bowl final next Friday. But there was little chance that his teammates would miss out once the Harris signalled for penalties. 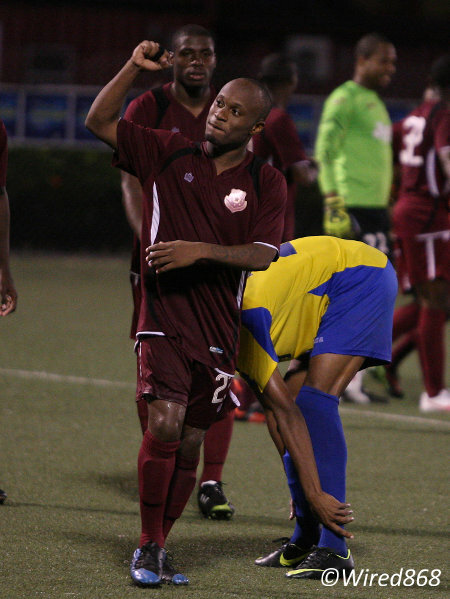 Photo: North East Stars right back Kennedy Hinkson celebrates a successful penalty in a previous shoot-out. Mitchell was again wasteful as he clipped his effort off the top of the bar. And all five Stars kickers, Manners, John (E), Kareem Moses, Kaashif Thomas and Hinkson, scored to book their place in the last competitive match of the season. It should be an intriguing final. W Connection (4-2-1-3): 21.Alejandro Figueroa (GK); 39.Alvin Jones, 5.Elijah Joseph, 4.Daneil Cyrus, 32.Kurt Frederick; 12.Gerrard Williams, 8.Clyde Leon (captain) (20.Silvio Spann 59), 14.Hashim Arcia, 17.Andrei Pacheco, 26.Stefano Rijssel (31.Jerrel Britto 74), 65.Neil Benjamin (36.Joevin Jones [vice-captain] 52). Unused substitutes: 22.Aquelius Sylvester (GK), 2.Jelani Grosvenor, 29.Jomal Williams, 42.Tremain Paul. Defence Force (4-2-3-1): 1.Kevin Graham (GK); 8.Curtis Gonzales, 2.Glynn Franklyn, 20.Rodell Elcock, 21.Aklie Edwards; 32.Dave Long (9.Richard Roy 52), 18.Sean Narcis (81.Adrian Welch 87); 11.Kevon Carter (captain), 15.Jerwyn Balthazar, 17.Ross Russell Jr (29.Jemel Sebro 52), 10.Devorn Jorsling. Unused substitutes: 25.Sheldon Clarke (GK), 7.Balendemu Julius, 19.Dexter Pacheco, 28.Dwight Scott.